A recent article from Sky News has reported that John McCririck is seeking a staggering £3 million in damages for his recent sacking from Channel 4 racing. News emerged in late October that John McCririck had been dropped as the face of Channel 4 racing, despite being one of the longest standing and recognisable faces of sport. Best known for his distinctive sideburns and deerstalker hat, Channel 4 claim John was sacked as a result of ‘audience research’, which suggested he was no longer in favour with the majority of viewers. 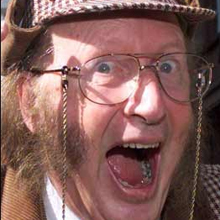 Claiming his axe from the TV broadcaster was instead due to his age however, McCririck is seeking around £3 million in damages, for what he believes is age discrimination. A statement issued for his case reads “After 29 years with Channel 4 Racing, on a rolling annual contract, I have been sacked without any consultation or cogent explanation. I am 72.” McCririck hopes to see a payment of around £500,000 reach him, which will be due to loss of future earnings, career damage, public humiliation, stress and mental anguish, whilst the remaining £2.5 million will be split, with part of it being donated to charitable organisations looking to prevent negative prejudice within the workplace. McCririck statement continued, showing support for such causes, by saying “Ageism is illegal. For tens of thousands of employees it has become the feared scourge of our society. This litigation should prove to be a watershed. There’s no upper limit to the amount of damages employment tribunals can award under the Equality Act 2010.” John McCririck is being represented by an employment and sport law specialists, solicitor Stephen Beverley, of Cavendish Legal Group, and will seek a quick settlement to this potentially long-drawn case. To book John McCririck for your event, contact Prime Performers on 020 7251 8222, complete our online enquiry form or email info@primeperformers.co.uk.